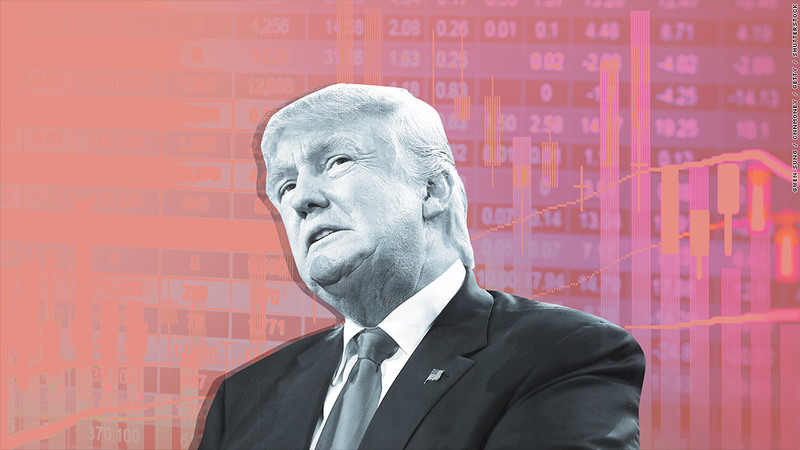 What will President Trump mean for stocks? Here's a sign that Wall Street believes Donald Trump will be able to make America grow again: small-cap stocks are on fire since the election. 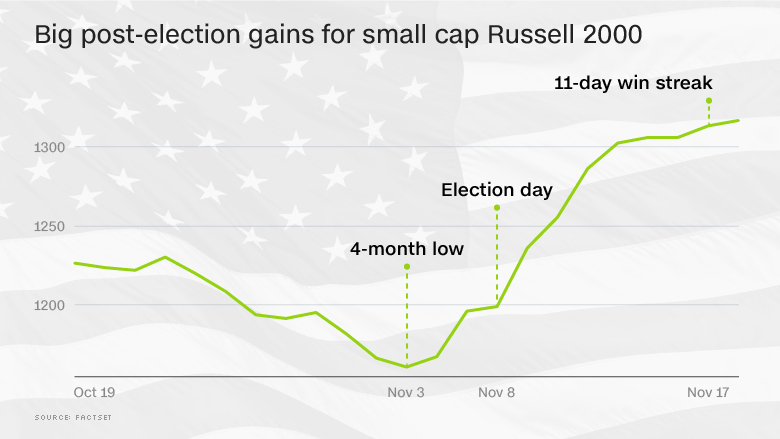 The Russell 2000 index of small stocks has spiked 10% to all-time highs since Election Day, blowing past the solid advance by the rest of the market. That's more than four times the advance for the S&P 500, which caters to bigger stocks. Not just that, but the Russell 2000 is on track for its 11th straight gain. That would be the longest win streak for small caps since June 2003. So why is a bet on small-cap stocks a bet on America? It's because the companies in this index have little exposure to overseas markets -- and are closely linked to the American economy. Wall Street is clearly starting to believe that Trump's infrastructure and tax plans will boost growth. "Lighting the match to the rally has been optimism that a Trump presidency could spark the domestic economy," said Ryan Detrick, senior market strategist at LPL Financial. Trump has promised to unleash more than $1 trillion of spending on roads, bridges and airports in an effort to stimulate growth. He also wants to cut taxes and remove excessive regulation, two other ideas that businesses have been pushing for. The Russell 2000 surge is part of a broader move towards risky assets since the election. Stocks in general are doing great, with the Dow and Nasdaq hitting record highs in recent days. Safer plays, especially government bonds, are slumping. "The overall outlook compared with prior to the election is substantially better," said Chris Retzler, who manages the Needham Small Cap Growth Fund (NESGX). "We're on a path of higher economic growth." Of course, Trump's calls for tariffs on goods imported from Mexico and China raises the specter of a scary trade war that could be very bad for multinationals like Apple (AAPL), Ford (F) and Nike (NKE). But that would presumably have less impact on small cap stocks, which historically have little revenue from outside the U.S.
"Small companies are less at risk of any tightening of trade restrictions," said Randy Frederick, vice president of trading and derivatives at Charles Schwab. In any case, many are now wondering whether the post-election euphoria for small-cap stocks may be overdone. Much uncertainty remains over what policies Trump will actually be able to get through Congress. For instance, infrastructure spending is an idea that Republicans, which control both houses of Congress, have repeatedly blocked. And the expectation for more fiscal stimulus from Congress has caused a surge in borrowing costs in recent days. That's bad news for small-cap companies, which tend to have less room to maneuver when it comes to debt. Retzler conceded that a "corrective pullback" for small-cap stocks would be "good and healthy" given the recent rally.